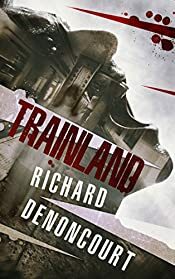 MystereBooks is pleased to feature Trainland by Richard Denoncourt as today's third free mystery ebook (A Suspense Thriller; Kindle format only). This title was listed for free as of the date and time of this post, June 30, 2013 at 7:30 AM ET. Prices are subject to change without notice. The price displayed on the vendor website at the time of purchase will be the price paid for the book. Please confirm the price of the book before completing your transaction. Life used to be good for Jack Devins. One of New York City's most in demand copy writers, Jack's life was a classic success story: degree from Columbia, adoring wife, happy family, a decent income. After the sudden, accidental death of his four-year-old daughter, Kelly — an accident for which he blames himself — Jack's life plunges into a nightmare. One night, Jack follows his dead daughter into one of the tunnels. What he finds there will change him forever, though not before pitting him against the demons of his past, and a danger that threatens the people he loves most.